​His research focuses on civil wars and political violence; ethnic politics and the political economy of development; and democracy, accountability, and political change. He is the author of Inside Rebellion: The Politics of Insurgent Violence (Cambridge University Press), which received the William Riker Prize for the best book on political economy. He is also the co-author of Coethnicity: Diversity and the Dilemmas of Collective Action (Russell Sage Foundation), which received the Gregory Luebbert Award for the best book in comparative politics. He has published articles in the American Political Science Review, American Journal of Political Science, Annual Review of Political Science, Journal of Conflict Resolution, Foreign Affairs, Foreign Policy, Journal of Democracy, World Policy Journal, and the SAIS Review. Zvika Krieger is the U.S. Department of State's Representative to Silicon Valley and Senior Advisor for Technology and Innovation. He works with the technology and innovation sectors on tackling global challenges and helps the State Department plan for the impacts of emerging technology trends. He previously created and led the Department's Strategy Lab, a team that utilizes design thinking, strategic foresight, and visual facilitation to convene diverse stakeholders and generate innovative solutions to complex international challenges. He also taught the inaugural Institute for Design + Public Policy at the Rhode Island School of Design. COLONEL U.S. ARMY SPECIAL FORCES (ret) and CONSULTING PROFESSOR, MANAGEMENT SCIENCE AND ENGINEERING. Felter retired from the US Army as a Colonel following a career as a Special Forces and foreign area officer with service in a variety of special operations and diplomatic assignments. While in the military, Joe held leadership positions in the US Army Rangers and Special Forces and participated in combat deployments to Panama, Iraq, and Afghanistan. Prior to coming to Stanford, he commanded the International Security and Assistance Force, Counterinsurgency Advisory and Assistance Team (CAAT) in Afghanistan reporting directly to Gen. Stanley McChrystal and Gen. David Petraeus advising them on counterinsurgency strategy. Felter helped establish the Combating Terrorism Center (CTC) at West Point where he served as Director from 2005-2008 and expanded its impact and reach as an international center of excellence for terrorism studies and policy analyses. He founded and is Co-Director of the Empirical Studies of Conflict Project (ESOC) and is a Senior Research Scholar at the Center for International Security and Cooperation (CISAC) and Research fellow at the Hoover Institution. In 2016 Joe co-created the Hacking for Defense class. Felter has published widely on topics relating to addressing the root causes of terrorism, insurgency and political violence and his work has appeared in top peer reviewed academic journals including the American Economic Review and Journal of Political Economy. He served as a member of the Army Science Board and has testified in both the US Senate and House of Representatives. A RETIRED EIGHT-TIME SERIAL ENTREPRENEUR, Steve's insight that startups are not smaller versions of large companies has reshaped the way startups are built and how entrepreneurship is taught. His observation that large companies execute business models, but startups search for them, led him to realize that startups need their own tools, different than those used to manage existing companies. Steve's first tool for startups, the Customer Development methodology, spawned the Lean Startup movement. The fundamentals of Customer Development are detailed in Blank's books, The Four Steps to the Epiphany and the The Startup Owner's Manual. Steve earned the Stanford University Undergraduate Teaching Award in Management Science and Engineering. 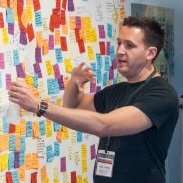 In 2011, he developed the Lean LaunchPad, a hands-on class that integrates Business Model design and Customer Development into practice through fast-paced, real-world customer interaction and business model iteration. In 2011, the National Science Foundation adopted Blank's class for its Innovation Corps (I-Corps), training teams of the nation's top scientists and engineers to take their ideas out of the university lab and into the commercial marketplace. In 2014 the I-Corps program was expanded to include the NIH, DOE, and DOD. Over 850 teams have gone through the I-Corps program. In 2016 Steve co-created the Hacking for Defense class. Students worked on actual national security problems use the Lean LaunchPad methodology. ​Deena joined Google in 2012. As a Global Partnerships Manager, Deena leads strategic partnerships for new products and special projects in Research. She previously spearheaded business development for autonomous units and Google[x], and led strategic partnerships for Google.org, where she was responsible for managing a multi-million dollar deal portfolio in civic innovation and computer science diversity. Prior to joining Google, Deena worked for the Obama administration--as a Presidential Management Fellow in the Office of Secretary Clinton, where she led public-private partnerships with Global 2000 companies, and previously as a Partnerships Advisor at USAID's Global Development Alliance, where she helped launch the President’s very first Global Entrepreneurship Summit in DC in 2010. Passionate about startup entrepreneurship, Deena co-founded her first company at age 19 and is an angel investor and advisor to several young companies. Outside of her work at Google, she is a Director on the Board of TechWadi, the leading nonprofit and accelerator building bridges between Silicon Valley and the MENA region, where she helps broker partnerships for and mentors young startups. In a previous life, Deena was an Aga Khan Fellow at The Aspen Institute's Program on Nonprofit and Social Innovation, where she supported the Global Philanthropy Program. She also covered the White House for BBC News and was the Lead Anchor for a bilingual news show on Al Arabiya. Deena holds a joint BA in Social Studies and Near Eastern Languages and Civilizations from Harvard College and an MA from the Georgetown University School of Foreign Service. She delivered the 2008 Harvard Class Day speech, "From Baghdad to Boston: Dropping the Global H-Bomb." Deena serves on the Board of Directors of TechWadi, The Project on Middle East Democracy, the Harvard Alumni Association, the Arab Film Festival, and the Asian University for Women. She is also on the Brain Trust of Girls Who Code. ​​Beth Van Schaack is the Leah Kaplan Visiting Professor in Human Rights at Stanford Law School—where she teaches in the areas of international human rights, international criminal law, and atrocities prevention—and a Faculty Fellow with the Handa Center for Human Rights & International Justice at Stanford University. Prior to returning to academia, she served as Deputy to the Ambassador-at-Large for War Crimes Issues in the Office of Global Criminal Justice of the U.S. Department of State. In that capacity, she helped to advise the Secretary of State and the Under Secretary for Civilian Security, Democracy and Human Rights on the formulation of U.S. policy regarding the prevention of and accountability for mass atrocities, such as war crimes, crimes against humanity, and genocide. This involved extensive work within the interagency to help coordinate the deployment of a range of diplomatic, legal, economic, military, and intelligence tools to expose the truth, capture and judge those responsible, protect and assist victims, enable reconciliation, deter atrocities, and build the rule of law. She continues to serve as a Special Government Expert on the State Department’s Advisory Committee on International Law. At Stanford, she has also been a Visiting Scholar with the Center for International Security & Cooperation of the Freeman Spogli Institute. Van Schaack joined the Santa Clara faculty from private practice at Morrison & Foerster LLP where she practiced the areas of commercial law, intellectual property, international law, and human rights. Prior to entering private practice, Van Schaack was Acting Executive Director and Staff Attorney with The Center for Justice & Accountability (CJA), a non-profit law firm in San Francisco dedicated to the representation of victims of torture and other grave human rights abuses in U.S., international, and foreign tribunals. She was also a law clerk with the Office of the Prosecutor of the International Criminal Tribunal for the Former Yugoslavia. She continues to advise a number of human rights and international justice organizations, including: the Documentation Center of Cambodia (DC-Cam), the International Institute for Criminal Investigations (IICI), the National Institute of Military Justice (NIMJ), the International Justice Resource Center (IJRC), the Syrian Commission on International Justice & Accountability (CIJA), CJA, and Accountability Council. Paul Narain is a National Security Affairs Fellow at the Hoover Institution, representing the U.S. Department of State. A career diplomat, Paul was most recently the Deputy Counselor for Economic Affairs at the U.S. Embassy in Greece, responsible for macroeconomics and the political-economy of the Greek economic crisis. Prior to that, he was head of the internal political affairs team at the U.S. Embassy in New Delhi, India. In Washington, he served on the Executive Secretariat Staffs of Secretaries Clinton and Rice and served as a Watch Officer in the Operations Center, the Department’s 24-hour crisis management team. Overseas, he has also served as a Political Officer at the U.S. Embassy in Baku, Azerbaijan, and as Assistant Public Affairs Officer and Consular Officer at the U.S. Consulate in Kolkata, India. He has received several superior and meritorious honors awards as well as the American Foreign Service Association’s Matilda Sinclaire Award for outstanding foreign language study. A native New Yorker, Paul earned a Bachelor of Arts from Johns Hopkins University and a Master of Arts in Law and Diplomacy from Tufts University’s Fletcher School. ​A career diplomat, Andrew Moore is currently pursuing a Masters in Business Administration degree at Stanford. For the past two years Andrew served on the State Department’s Executive Secretariat Staff, circling the globe supporting Secretary of State John Kerry’s engagements on issues as wide-ranging as nuclear negotiations with Iran, a framework agreement on climate change, and the re-establishment of diplomatic relations with Cuba. Previously, he led the Political and Economic Section at the U.S. Consulate in Melbourne, Australia. From 2011-2012, Andrew served as a Consular Officer at the U.S. Embassy in Islamabad, Pakistan. His first assignment was as Australia and Pacific Regional Affairs Desk Officer in Washington D.C. Originally from Michigan, Andrew joined the Foreign Service after graduating with honors from Harvard College in 2008. ​Pablo works at the nexus of public policy, business strategy, and technology. He leads Asia Pacific public policy for Salesforce, a cloud computing company based in San Francisco, CA. Working cross-functionally with Privacy, Technology Compliance, Technology Security, and Sales, Pablo helps develop Salesforce’s policy positions and build the company’s political brand equity in Asia. One of his overarching goals is to take public policy to new levels of innovation, design and creativity. While posted at the U.S. Embassy in Beijing, Pablo co-founded “China Teaming”. China Teaming is an experiential competition getting first and second tour officers posted in China to work in teams across functions and levels to respond to real world scenarios in U.S. diplomacy. Pablo’s passion projects are growing employee diversity in the technology and public sectors, supporting “sport-for-development” projects and volunteering with BUILD.org in Oakland, CA. Pablo is a graduate of Brown, where he majored in international relations and played on the Men’s Varsity Soccer Team). He also attended the Harvard Kennedy School as a Thomas Pickering Fellow. Pablo was born in Mexico City, Mexico. He lives in San Mateo, CA with his wife Silvana and six month old baby, Matias Emilio. Scott Kilner served for 32 years as a career diplomat with the U.S. Department of State. He retired in September 2013 with the rank of Minister-Counselor, at the conclusion of his last assignment as Consul General in Istanbul, Turkey. Over the course of his career, Mr. Kilner worked in Washington and at nine overseas postings: four in Europe, four in Turkey, and one in Afghanistan. Prior to Istanbul Mr. Kilner served from 2009-10 in Afghanistan, as foreign policy advisor to the U.S. Commanding General of Bagram Air Base and then as Director of the U.S. Embassy’s Office of Interagency Provincial Affairs. In the latter capacity, he oversaw the tripling of U.S. civilians assigned to provincial reconstruction teams throughout the country. Before Afghanistan, Mr. Kilner served in Vienna, Austria as Deputy Chief of Mission and Charge´ d'Affaires of the U.S. Embassy from 2005-09. Mr. Kilner joined the U.S. Foreign Service in April 1981. His first postings were to Istanbul, Turkey, as Consular Officer from 1982-83; to the U.S. Embassy to the German Democratic Republic (East Berlin) as Economic Officer from 1983-85; and as Political-Economic Officer at the U.S. Consulate in Adana, Turkey, from 1985-87. From 1987-92, Mr. Kilner held a series of positions in the Department of State's Bureau of European Affairs. Following a year in the Office of European Regional Economic Affairs (1987-88), he served as Special Assistant to Assistant Secretary for Europe Rozanne Ridgway (1988-89). From 1989-92, Mr. Kilner worked in the Office of Central European Affairs, first as Country Officer for Austria and Switzerland, and then as Country Officer for Germany, focusing on the economic consequences of German unification. During the spring of 1991, Mr. Kilner served temporarily with Operation Provide Comfort in Southeast Turkey and Northern Iraq, assisting with the Kurdish refugee crisis following the first Iraq war. From 1992-96, Mr. Kilner was posted to Paris, France, as Counselor for Economic Affairs during the end-game of the GATT Uruguay Round trade negotiations. From 1996-99, he served as Economic Counselor in Ankara, Turkey, focusing on regional Caspian Basin energy development and Turkish economic stabilization and reform. Mr. Kilner returned to Washington in 1999 to participate in the 42nd Senior Seminar, the U.S. Government's senior professional development program for foreign policy and national security officials. He then became Director of the State Department's Office of Western European Affairs from 2000-02, responsible for U.S. bilateral relations with France, Italy, Spain, Portugal, Malta and the Holy See. From 2002-05, Mr. Kilner served at the U.S. Embassy in Rome, Italy, as Minister-Counselor for Economic Affairs. Mr. Kilner is the recipient of numerous State Department awards. He speaks German, Turkish, Italian, and French. A native of the San Francisco Bay Area, Mr. Kilner graduated from Stanford University (B.A. 1974) and The Johns Hopkins School of Advanced International Studies (M.A. 1978). He and his wife, Jan Kilner, have two grown children, Derek and Melinda. Mr. Kilner's personal interests include photography, opera, architecture, and European and Turkish history. A recovering surfer, Mr. Kilner still loves the open waters, swimming three times across the Bosphorus and once across the Hellespont during his last posting. ​​Sam Gussman is a recent graduate from Stanford University's Symbolic Systems department with a concentration in Human-Computer Interaction. A proud Jack-of-all-trades, Sam is an innovator with a diverse skill-set and he regularly draws on a wide range of experiences. A member of the inaugural Hacking4Defense class, Sam is true convert and believer in the Lean Launchpad Methodology. In past lives Sam has worked at the Virginia Institute of Marine Science, wikiHow, a nano-fabrication lab, an archive, a phone company, a bakery, and the town dump (just to name a few). Sam’s long-term interests include the intersection of computer vision and small UAS, cyber-security and defense policy, the dynamic generation of aesthetic patterns, virtual reality content creation, and utilizing Augmented Reality to reduce the cognitive load of soldiers in combat. Shazad Mohamed is currently studying Political Science at Stanford where his research focuses on how militant groups use technology to reach new audiences. He previously worked as Product Manager at Facebook where he led the Friending and Recommendation Ranking teams. Prior to that, Shazad co-founded a Y Combinator backed company that developed secure messaging software for smartphones. His interests include foreign policy, cyber security, and technology innovation. Roland is the Senior Analyst for Hacking For Defense, Inc. He lived for a year in Paris, France and Amman, Jordan and wrote his Senior Honors Thesis on why violent extremists choose to leave extremist groups. He has conducted research on Turkish Civil-Military Relations and Bahrain's Youth movements, and he graduated from Tufts University in 2016 with B.A. in International Relations.